Download the most recent LTS (Long-Term Support) release for your computer. Make sure to match your operating system (Windows or Mac) and architecture (32-/64-bit). Open a Command/DOS window (if running on Windows) or a terminal window (if running on Mac) and type "node --version" (no quotes). A message should appear with a version number (e.g., v6.10.3). Mac: select the link for the latest Mac installer. After it downloads, double-click on cadet-setup-[version number].dmg. When the image mounts, drag the CADET application to your Applications folder. You can place a shortcut to CADET in your dock if you'd like. Windows: select the link for the latest Windows installer. After it downloads, double-click on cadet-setup-[version number].exe. When the installer runs, accept all of the defaults (or specify a new installation location). A CADET shortcut will be placed on your desktop. Linux: select the link for the latest cadet.zip. 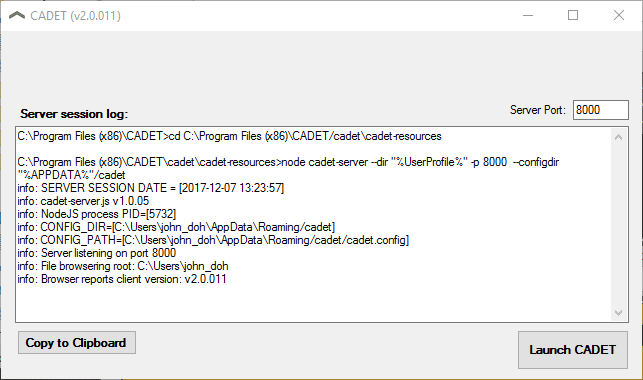 After it downloads, unzip it, placing the "cadet" directory somewhere where it will be writeable (by default CADET's preference file is placed in the "cadet" directory tree. Note: If you are installing a CADET update, please be sure to QUIT all previous instances of CADET before installing and running the update: from within CADET, open CADET's File menu and choose Quit. Use the double-clickable application you installed above. Double-click on the CADET application, and CADET will open in your default browser. Double-click on the CADET shortcut, and CADET will open in your default browser. Launch from a terminal window. Under most circumstances, you will not need to interact with the launcher. When you are finished using CADET, quit the application by choosing CADET's File menu and selecting Quit. Do not quit CADET by closing the launcher. Doing so will display a dialog that warns you that all unsaved changes will be lost. 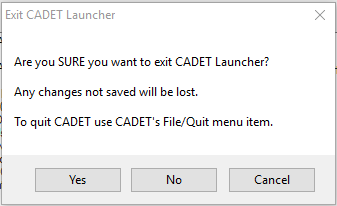 When you quit CADET, the launcher will automatically close. To open CADET again, simply double-click on the desktop shortcut. © 2017 Carl and Ruth Shapiro Family National Center for Accessible Media. All rights reserved.